Where to camp in the mountains near Asheville? You have many choices, and here are our top places. First of all, you will need to decide if you are looking for backpacking with remote camping or a campground with hot showers and parking! 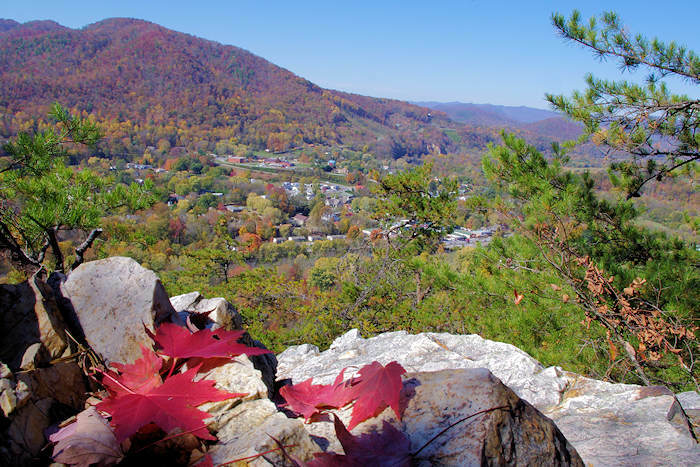 With all of the national park and forest land surrounding the city, there are limitless places to camp and explore our North Carolina mountains in your RV. Do your homework first, especially if you are new to camping. Bear activity (especially around established campsites) is increasing, so read our bear safety tips. Two of our favorite backpack camping spots are Black Balsam Knob (pic at very top of page) and Max Patch (pic above). 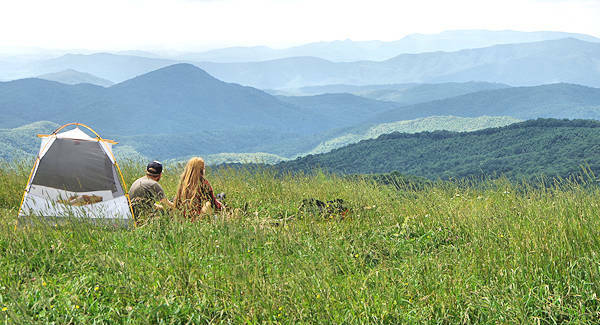 Both are Pisgah National Forest balds with grassy knolls and even established fire rings. Also, they are short hikes from the car! Just watch the weather forecast - these are not places to be in a thunderstorm or high winds. 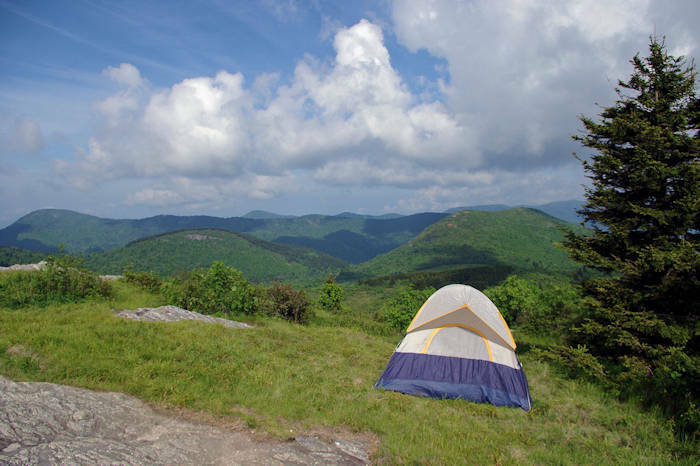 The Parkway has four camping areas in the Asheville area, open April or May through October. Camping is $20/night for all campgrounds, first-come first-serve. Advance reservations accepted at all campgrounds except Crabtree Falls. Camping along the Parkway is permitted only in designated campgrounds. NOTE: Firewood must be heat-treated (sold at local stores). Linville Falls Campground at Milepost 316 on the Linville River has access to the trail system into Linville Gorge Wilderness Area, including hiking trails to Linville Falls. 50 tent sites, 20 RV and 2 wheelchair accessible. Flush toilets and drinking water. Open in early April through October. Reserve online or call 1-877-444-6777. Crabtree Falls Campground at Milepost 340 is home to the Crabtree Falls Trail. 70 tent sites, 22 RV and 4 wheelchair accessible. Open mid-May through October. First-come, first-serve. Mt. Pisgah Campground at Milepost 408 is the highest Parkway campground at almost 5,000 ft. elevation. 64 tent sites, 62 RV and 3 wheelchair accessible. Flush toilets, drinking water, showers and store. Hike to the top of Mt. Pisgah. Open mid-May through October. Reserve online or call 1-877-444-6777. Julian Price Park at Milepost 297 (near Blowing Rock) has the largest campground on the Parkway. For backpacking, check out the Black Balsam Knob area adjacent to the Parkway in Pisgah National Forest. Lake James State Park: A variety of camping options: 20 walk-in campsites (short walk of up to 300 yards) are located along the shoreline at the Catawba River area - with fire pit, picnic table and room for a six-person tent, plus washhouse and hot showers. 33 drive-in sites at the Paddy's Creek area have parking for two vehicles, fire pits and a washhouse. Boat-in camping on the Long Arm Peninsula with 30 campsites with fire pit, table and space for six-person tent - reservations required. Canoes and kayaks for rent. Cost is $10-$23/night. Located 50 miles east of Asheville. Get details and make online reservations. South Mountains State Park: Family campground has 18 campsites with picnic table and fire circle. Bathhouse with hot showers. Make reservations or stop at park office upon arrival. They also have 20 backpack camping sites in six remote areas of the park. Each camping area has a pit toilet. Equestrian camping area has 15 campsites, 33-stall barn and washhouse with hot showers and flush toilets. Open year-round. Located about 70 miles east of Asheville. Get details and make online reservations. Mount Mitchell State Park: Camp on the highest peak east of the Mississippi! The nine-site family campground is open throughout the year. Only tent camping is allowed. Each site is equipped with a grill and picnic table. Modern restrooms for use during warm seasons are located nearby. Showers and hot water are not provided. In the winter, campers have access to pit toilets, and no running water is available. Campers may leave vehicles in the park overnight to backpack into the Pisgah National Forest. Visitors who leave their vehicles in the park must register on the forms provided at the trailheads near the parking area or at the park office. Be prepared for extreme weather changes and temperatures about 20 degrees cooler than Asheville. See reservation info. Lake Powhatan Campground: Located at the Lake Powhatan Recreation Area of Bent Creek, it is just outside the city of Asheville and offers privacy and wooded camp sites. Open April through October and has flush toilets, hot showers and swimming area. Ride your mountain bike right out of the campground onto the Bent Creek area trails! See our Lake Powhatan Guide for more info. Reserve online or call 1-877-444-6777. North Mills River Campground: Located just outside of Asheville. Riverside and rustic. Nearby to the NC Arboretum and Blue Ridge Parkway. Open year round. Many hiking and mountain bike trails. Reserve online or call 1-877-444-6777. Davidson River Campground: Located just 4 miles from the town of Brevard and about 22 miles from Asheville. Very popular spot, located on the Davidson River along US Highway 276. Near Sliding Rock and Looking Glass Falls. Restrooms and showers. Tubing spot. Interpretive programs in summer. Open year-round. Reserve online or call 1-877-444-6777. Black Mountain Campground: Sits in the shadow of Mt. Mitchell with 43 camping sites, none with hookups. All campsites have tables, fire rings with cooking grills and lantern posts. Nearby are flush toilets, drinking water, trash cans and showers. Home to Setrock Creek Falls. It's open mid-April through October. Call 828-682-6146 for more info. Pay cash or check at gate. Carolina Hemlocks Campground: Located near Mt. Mitchell along the South Toe River near NC Highway 80. This jewel is not as crowded as many other campgrounds! Enjoy tubing, fishing and swimming. 31 primitive sites, bathhouse with hot showers and trails for biking and hiking. Open April-October. Reserve online or call 1-877-444-6777. Rocky Bluff Campground offers solitude in a wooded setting in Pisgah National Forest about three miles south of Hot Springs. The 1.2-mile Spring Creek Nature Trail circles the campground and meanders beside the creek, an excellent trout stream. There are 15 campsites with a parking spur, picnic table, tent pad and fire grate. Open late May through early September. 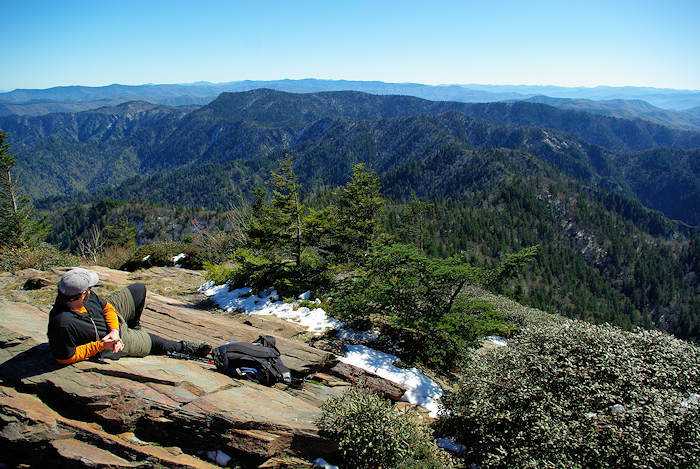 Linville Gorge Wilderness Area offers primitive camping in remote, rugged areas for experienced hikers and campers. You must register on weekends in May-October. Roadside Camping: There are many roadside campsites in Pisgah Ranger District that are free to use, first-come first-serve. They have a tent pad, fire ring and parking space. Read details and map for roadside camping. Remote Camping: Dispersed / primitive camping for backpackers is permitted anywhere within the Pisgah National National Forest boundaries except within 1,000 ft. of a roadway, parking area or trail. Find smaller campgrounds in Nantahala National Forest. You can also backpack to remote areas or find a roadside campsite. To explore the most remote areas (fewer people), head 90 miles west of Asheville to Graham County. Campgounds are open April-October. $15-$20/night. Cheoah Point: On Lake Santeetlah, 18 tent/camper sites, 6 RV, bathhouse, hot water showers, boat launch, beach. Near Joyce Kilmer Memorial Forest. Reserve online. Tsali: Mountain biking mecca at Fontana Lake with 42 campsites, showers, boat launch. First-come first-serve. Read about Tsali Recreation Area. Cable Cove: On Fontana Lake with 26 campsites, vault toilets. 4 miles from Fontana Dam and Appalachian Trail. Horse Cove: Near Lake Santeetlah and Joyce Kilmer Memorial Forest with 18 streamside campsites, flush toilets. Panthertown Valley Backcountry Area: Popular backpacking spot with many trails and waterfalls. No fee. For info, call 828-524-6441. Lake Santeetlah in Graham County offers lakefront camping as well as primitive roadside campsites along Joyce Kilmer Road. Free. First-come first-serve. On the North Carolina side of the Great Smokies, find many camping options. Read more about outdoors in the Smokies. Backcountry: Requires backpacking several miles to a site. A permit and advance reservation required for all backcountry camping in the park. Before planning your backcountry trip, go to the NPS Website for latest backcountry info. Or call the Backcountry Information Office at 865-436-1297. Frontcountry: Camping near your car (or RV) in a developed campground with restrooms with cold running water and flush toilets. No showers or electrical / water hook up. Each individual campsite has a fire grate and picnic table. Go to the NPS Website for more details. Cataloochee with 27 sites, $25/night, reservations required, open April-October. Reserve online or call 877-444-6777. Deep Creek with 92 sites, $21/night, open April-October, popular for waterfalls and tubing, near Bryson City. First-come first-serve. Smokemont with 142 sites, $21-$25/night, year-round, on Newfound Gap Road near Cherokee. Reservations recommended due to popularity. Reserve online or call 877-444-6777. Balsam Mountain with 46 sites, $17.50/night, 5,310 ft. elevation (highest campground in park), open Memorial Day through early October. Located off Blue Ridge Parkway. Reserve online or call 877-444-6777. Group Campground: Large campsites suitable for groups of eight people or more. Located in frontcountry campgrounds at Cataloochee, Deep Creek and Smokemont. Horse Camp: Small campgrounds, accessible by vehicle, that offer hitch racks for horses and primitive camping facilities. Cataloochee, Round Bottom & Tow String near Cherokee. 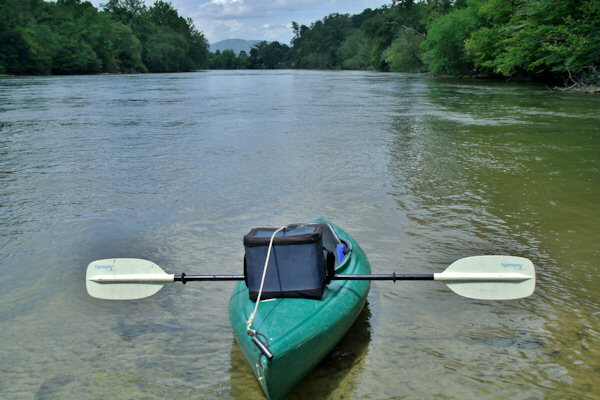 Riverside Camping: French Broad River Paddle Trail with primitive boat-in campsites along the river. Camp for Dogs: 4 Paws Kingdom Campground near Rutherfordton is the first and only dog-dedicated campground (campers & RVs) with a fenced-in swimming pond, multiple off-leash play areas, agility park, creek, doggie bathhouse with grooming station and more. If you don't have a RV or camper, rent one or a cabin. No tent camping. Many fun weekend special events. Adults only - 18 years or older. Read more about 4 Paws. Find campgrounds for tents, camper and RVs near several entrances to the Great Smoky Mountains National Park in the Cherokee, Fontana Lake and Bryson City areas. Leave No Trace: Protect the outdoors while camping! French Broad Campground: A riverside RV and tent campground of 13 acres, less than 12 minutes north of downtown Asheville, on 2,000 ft. of river frontage. Wilsons RV Park: Located on the French Broad River in West Asheville, near Carrier Park and along the greenway. A short drive to Biltmore and downtown. Asheville East KOA: 55 wooded acres in east Asheville, just minutes from Black Mountain, with two fishing lakes, trout stream, swimming pool, mini-golf and paddle boats. Asheville West KOA: Tent sites are beautifully wooded, and "big rig" friendly 50- and 30-amp pull-through sites are large, level and have cable TV and WiFi. Taps RV Park: Located 1/2 mile from I-40 in east Asheville. Each RV site has a concrete pad and patio with privacy fence. Large level pull-thrus accommodate the largest RVs. Sites available along Swannanoa River. Bear Safety: When camping, be sure to store your food securely to prevent black bear interactions. See our Bear Safety Tips.